Emulin Frequently Asked Questions ? EMULIN® is the world’s first “carbohydrate manager.” The actives in EMULIN® help your body overcome the negative effects of carbs in natural and holistic ways. Modern day food processing has stripped “EMULIN®-like compounds” from our diet. These need to be added back by supplementation — 750 mg of EMULIN® effectively provides this. The formula that Dr. Joseph Ahrens has been working on for 12 years has just gotten even better, with an additional 4th ingredient – Gallic Acid – a powerful polyphenol abundantly found in Nature but largely removed by food processing. Gallic Acid works in synergy with the other 3 ingredients making the Emulin® E formula even more powerful. Based on a growing body of scientific evidence, this formula will work faster, better, and more importantly, deeper, not only to help your body better manage carbohydrates but also quell the “silent inflammation” linked to excessive carb intake over time. Emulin® E is a formula that improves on M and C. As the effects are faster and better, there is no need for more formulas. How is Emulin® E an improvement on Emulin® C or Emulin® M? Emulin® E innovates the best and most tested formula of Emulin® which is Emulin® C and adds Gallic Acid that makes it far more effective and faster acting. What if EMULIN® E does not work as well as EMULIN® M and C? 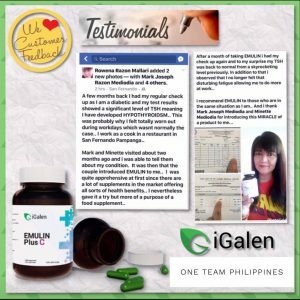 People that have been taking Emulin® E report of its fantastic benefits even sooner, Chances are you were taking more than 3 capsules per day of Emulin® M or C. Hence, if that worked for you, you need to take more than 2 capsules of Emulin® E per day. What is the dosing guide? 750 mg per day. For Emulin® C and M it’s 250mg per capsule. You need to take 3 a day. Emulin® E is 375mg per capsule. You need just 2 capsules a day. This polyphenol is found in almost all plants. It is an anti-oxidant and anti-inflammatory. Plants that are known for their high Gallic Acid content include gallnuts, tea, hops, grapes, and oak bark. Gallic Acid has a very long history of use for human health. Indeed, it has been recorded since the time of Hippocrates. Could I be sensitive or allergic to Gallic Acid? Since it is so abundant in Nature and found in tea, coffee, and practically all fruits and vegetables, it is unlikely that people will be sensitive or allergic to it. As it is found everywhere, it is totally safe and does not interact with medicines. It is safe for all people, and in all phases of life. EMULIN® E is made of substances that are found abundantly in Nature. In fact, the actives on EMULIN® E should be part of your daily diet. As such, there should be on interactions with known drugs. However, you are advised to consult with your doctor for specific medicines. How about interaction with blood thinners? We would not recommend that those on warfarin take EMULIN® E. However, there no negative interactions with other blood thinners based on studies involving the actives of EMULIN® and the experience of our users. Nevertheless, we would recommend that you talk to your doctor.